Every year, my boyfriend and I look over the Tony nominees and pick our favorites. Not who we think will win, mind you, but whom we would choose if we were Tony voters. Here is a list of whom we would like to win with a guess or two at who will. Enjoy. Our pick: Red. Playwright John Logan did a tremendous job of capturing how much Art mattered to Modernist painter Mark Rothko. Time Stands Still is as smart and well-written, but not as insightful. Our pick: Memphis. This is a very good – but not great – show, that in a more competitive season might not capture the prize. This season, however, it is easily the most well-rounded, successful musical. Both American Idiot and Fela! were more ambitious, but neither show quite achieved everything they aimed for. Our pick: Memphis. David Bryan’s music, while it is more ’60s rock & soul than ’50s r&b, is miles more sophisticated than his work on The Toxic Avenger or anything he did with Bon Jovi. It isn’t a very competitive season in this category, with Memphis featuring the only successful musical theatre score of the season. Our pick: A View from the Bridge. The entire production was a class act. It didn’t suddenly become my favorite play by Arthur Miller, but this production was rock-solid, hitting every level of this play and adding a few more. Our pick: La Cage Aux Folles. I have to say that it’s the most authentic, fun and touching version of this drag-centric story I’ve ever even heard of. From the Chorus of Cagelles on up, a sassy, heartfelt winner. Our pick: Douglas Hodge, La Cage aux Folles. I don’t think I’ve seen an Albin that’s as believably a drag diva as the one Hodge gives us. He doesn’t just add a fey layer to the songs he sings, as some Albins do. He sings this line as Piaf, this line as Dietrich. Nagaujah was hot as Fela Kuti, and its very much apples and oranges. Egregiously overlooked: Nathan Lane working his tuchus off in Addams Family. Our pick: Montego Glover, Memphis. She positively glowed as beautiful, black rhythm and blues singer Felicia. Sherie Rene Scott gets an A for hard work and charisma, and Zeta-Jones was better than anybody expected, but this should be Montego’s. Our pick: Liev Schreiber, A View from the Bridge. Eddie Carbone was played with great sensitivity by one of the most intelligent and talented hunks of the American stage and screen. Molina and Washington were also both magnificent, but Liev just dug deeper. Egregiously overlooked: Norbert Leo Butz in Enron and Michael McKean in Superior Donuts did work at least on a par with the nominated actors. Our pick: Laura Linney, Time Stands Still. Linney is a marvel, investing her hard-bitten photojournalist character with serious gravitas and deep emotions that percolate suddenly and unexpectedly to the surface. Davis is also particularly good, and Maxwell was this year’s hardest working comedian in non-musicals, which deserves some kind of recognition. Our Pick: Jon Michael Hill, Superior Donuts. In a play that was all about character portraits, Hill delivered a knockout performance, really getting under skin of a young black writer marking time in the titular coffee shop. Our pick: Jessica Hecht, A View from the Bridge. Hecht was marvelous early in the season in the ill-fated Brighton Beach Memoirs, in a comic relative of the character she played in View. She nailed every layer of her role in View, from the tough Brooklynese patter to her heart-rending scream at the end. Our pick: Angela Lansbury, A Little Night Music. At 84, Lansbury has more lines than the rest of the entire bunch, which she delivers with great panache and depth. The only serious competition would be fellow octogenarian Cook, who has more, and more complex, Sondheim lyrics to sing – but no actual part to play. Egregiously overlooked: Jackie Hoffman working almost as hard as Nathan Lane in Addams Family. Our pick: Alexander Dodge, Present Laughter. Garry Essendine, Noël Coward’s comic hero, is way over the top, so why shouldn’t his apartment be, too. Alexander Dodge’s set is a luscious Deco marvel, packed with character. Our pick: Christine Jones, American Idiot. Across the board, American Idiot was the most innovately designed show of the season, and that all starts with Jones’s tricked-out, poster-plastered set. Our pick: Catherine Zuber, The Royal Family. Zuber is Broadway’s reigning queen of beautifully designed and constructed period costumes, and her work on The Royal Family, packed with dramatic 1920s chic, did her proud. Our pick: Matthew Wright, La Cage aux Folles.Wright very smartly designed the clothes as 1970s French street chic, with lovely results. And as for the Cagelles: They’re not the collection of drag chorines you see in other productions of La Cage. They are six individual drag queens corralled into performing together. Some of that is casting, but a lot of it is the distictive looks Wright gave to each of them. Our pick: Mark Henderson, Enron. A show about an energy company had better damn well have great lighting, and Henderson certainly didn’t disappoint. From light-saber-like sticks to heavy-metal pyrotechnics, Henderson pulled out all the stops. Our pick: Kevin Adams, American Idiot. Adams did things to my eyeballs that I hadn’t seen outside of a rock concert or a doctor’s office. Some of the lights focused on the audience were too much, but when Adams got the balance right, it looked like something really new. Our pick: Adam Cork, Enron. Thunderclaps, choruses of traders, zings, zaps – and the Propellerheads! As with lighting, the sound for a show about a power company should crackle, and crackle it did. Cork is his own biggest competition, with his skillful, understated work on Red. 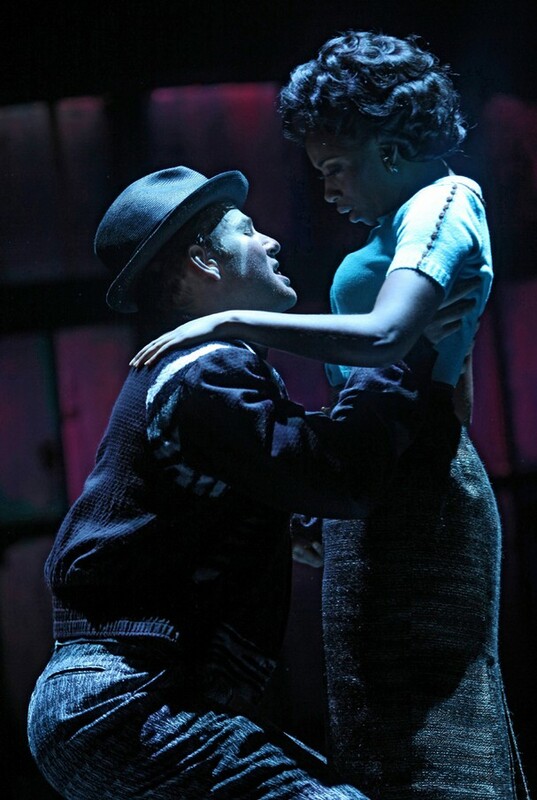 Our pick: Robert Kaplowitz, Fela! This show ranged all over the theatre, went from screaming loud to hushed, and Kaplowitz made sure that is was all crystal clear and lucid. Egregiously overlooked: Brian Rogers for American Idiot – too loud fer ya, grandpa? Our pick: Gregory Mosher, A View from the Bridge. Mosher helmed this with modest dignity and subtle power, as well as penetrating intelligence. This was my first encounter with this particular Miller play, and I feel like I’ve seen a production that advocated for it very well. Egregiously overlooked: Rupert Goold for Enron; sure, he was showing off, but damn the man has chops! Our pick: Bill T. Jones, Fela! Jones built this recreation of Fela Kuti’s Lagos, Nigeria “Shrine” from the ground up. Egregiously overlooked: Michael Mayer’s visionary work on American Idiot; if he was nominated, he’d be my pick. Our pick: Bill T. Jones, Fela! He added choreography that would have been beyond the abilities of the real life people he portrays, and yet makes it all fit comfortably within the world of the show. Our pick: Aaron Johnson, Fela! Fela Kuti’s Afrobeat was all about groove and mood. Johnson molds it to serve the pace of the story, without losing sight of its spirit for a nanosecond. Stunning.